I thought I knew my little village after living here seven years, but…surprise! I was in Izamal today listing three pretty lots on the outskirts of the town, and after finishing the photography and getting the lay of the land, so to speak, I stopped at a little stall to buy a bottle of fresh coconut water. Fresh coconut water for $1.50 a liter, cold and delicious. Who would have thought it? 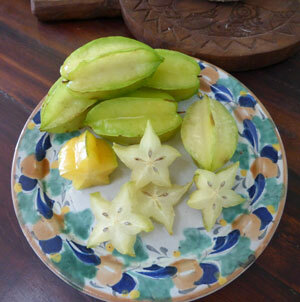 Sweet, juicy fresh star fruit on my doorstep at $1.50 for this plateful!